I made this manicure to go with my team outfit! Our shirts are bright green and our socks are zebra-striped with a hot pink edge. Even though this was quite simple, I’ll explain how I did this. 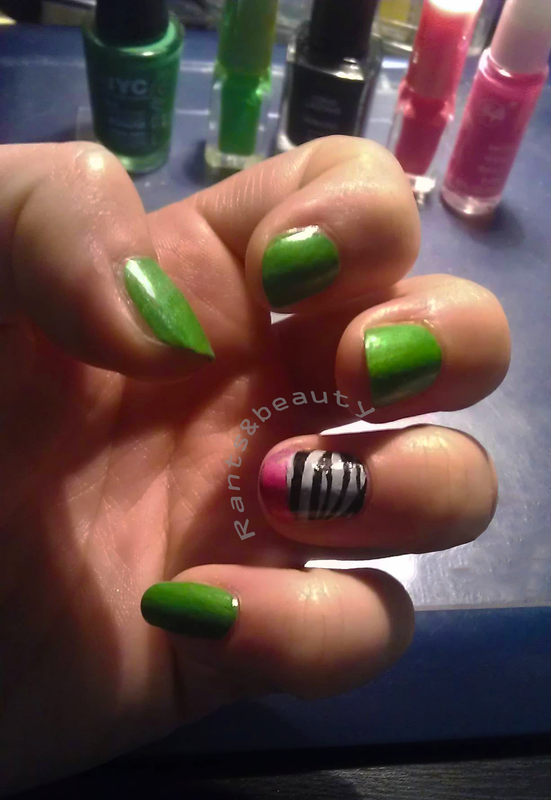 I started out by putting on the base coat, and then painted all nails but the ring finger with the NYC green polish. I painted the ring finger with the Miss Sporty black polish, since the shimmery black polish is very sheer. I then added the green (also very sheer) from the Action set to all green nails, and the shimmery black to the ring finger. For the zebra stripes, I used a stamping kit and white stamping polish. It does take some practice to get a nice and complete image from stamping, but you’ll eventually get the hang of it. For the zebra pattern it was important to scrape along the stripes, not across. The ‘French tip’ was created by creating a slightly curved stripe on the nail with the pink striper, and then (to add extra shine) topped with the pink from the Action set. After a layer of top coat, my nails were ready for the match!